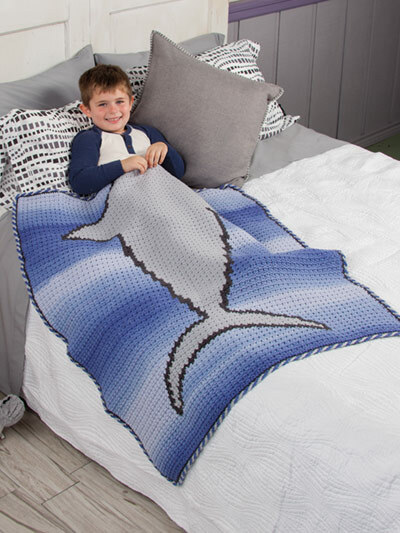 Crocheted mermaid and shark blankets have beeneverywhere the past couple years! 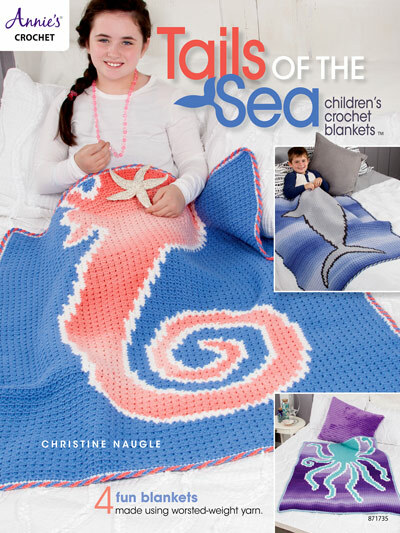 Tails of the Sea blankets look perfect for you little one's bed.... Especially if they love sea creatures! First Impression: Such a fun & practical way to make a sea creature for the kids! My Favorite Project Pick: One of my daughters wants to be a marine biologist and has this huge love for the octopus, so I’m picking the You Octopi My Heart as my favorite project pick. These blankets that Christine designed are a more practical version of the sea life blankets, but I’m all about things that will get a lot of use, so these are great! All the blankets are made with basic crochet stitches and have a skill level or easy. There are written instructions and graphs for each pattern. The booklet includes all your general pattern info (gauge, terms, abbreviations), a photo tutorial for the border, as well as a list of yarns that were used for each project. There are also a few photo tutorials in the back. *Disclaimer* - This book was provided to me for a review, but all opinions are strictly my own. 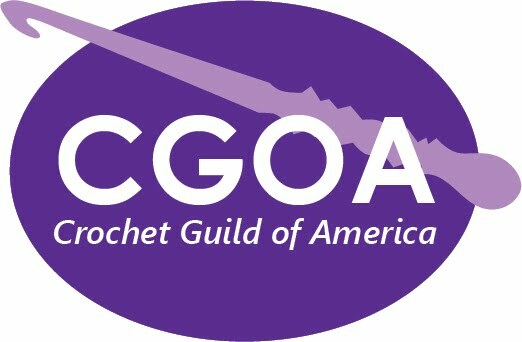 I'm Marie from Underground Crafter and I'm back to share a roundup of crochet patterns designed by Crochet Guild of America members. 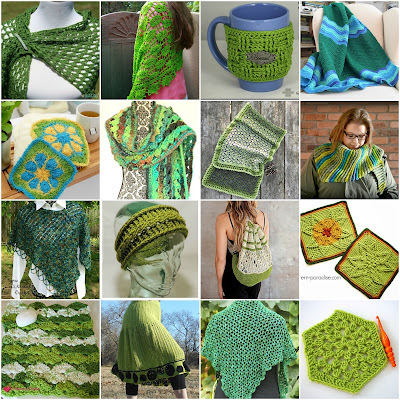 This month's roundup features 16 (mostly free) patterns in beautiful spring greens. 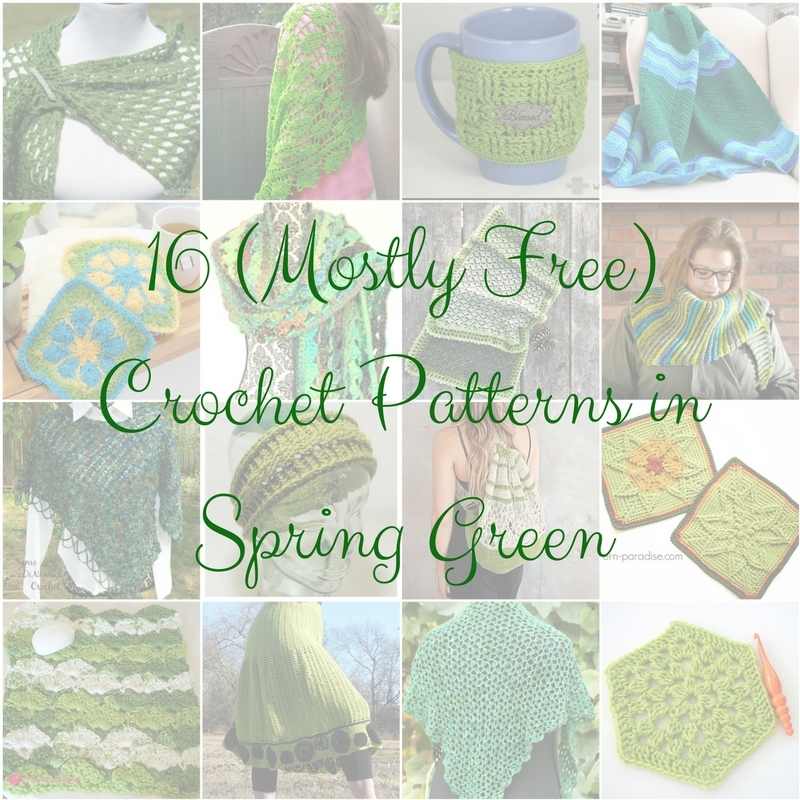 Of course, you can make any of these patterns in a different color if you choose. Olive Triangle Shawl, free crochet pattern by Busting Stitches: This lacy triangle shawl has a simple one row repeat. Tropical Flower Scrubby, free crochet pattern by The Purple Poncho for Red Heart: This textured scrubby pattern also makes a fun granny square. Meadowland Shoulder Wrap, free crochet pattern by Same DiNamics Crochet: This seamed poncho pattern includes several styling options. Apple Juicy Washcloth, free crochet pattern by American Crochet: This beautiful shell washcloth will make you smile with every shower. Foliole, premium crochet pattern by Karen Whooley: This is one of 12 stunning patterns in A Garden of Shawls. Evermore Wrap, free crochet pattern by Beatrice Ryan Designs: This super bulky wrap works up quickly. Cabled Ear Warmers, free crochet pattern by Jessie At Home: These stylish earwarmers are perfect for a chilly spring night! Odessa, premium crochet pattern by High Strung Crochet: This bold skirt pattern includes two variations so you can choose your preferred fit. Basket Weave Mug Cozy, free crochet pattern by Celtic Knot Crochet: This pattern includes a helpful photo tutorial. Three Pines Shawl, premium crochet pattern by Edie Eckman: This rectangular shawl has a jacquard look. Boutique Backpack, premium crochet pattern by ACCROchet: This is one of 22 patterns in My Crocheted Closet: 22 Styles for Every Day of the Week. Contextual Shawl, premium crochet pattern by Linda Dean: This shawl features a beautiful lace design that will highlight any yarn. The Wripple Blanket, free crochet pattern by Underground Crafter: This cozy throw is made with a simple, w-shaped ripple stitch pattern. 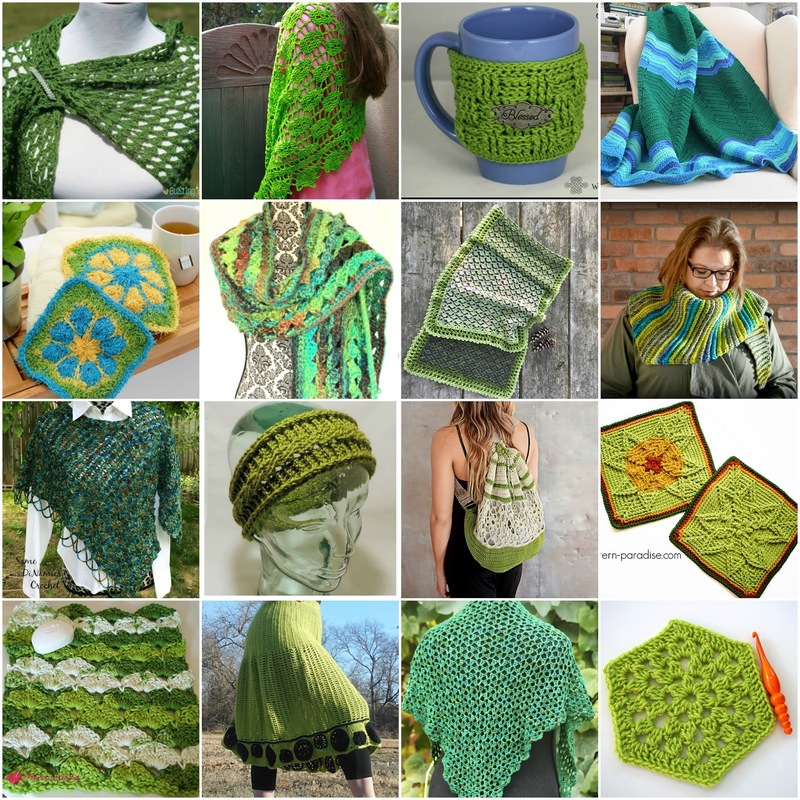 Lime Verbena Shawl, free crochet pattern by Marly Bird: This simple stitch pattern make a striking shawl when using a colorful yarn. Autumn Sun Square, free crochet pattern by Pattern Paradise: This textured motif looks great in a solid color or in stripes. Traditional Hexagon Motif, free crochet pattern by Moogly: This pattern includes both right- and left-handed video tutorials. I hope you enjoyed this month's roundup. I'll be back in March with another roundup of patterns by our members. 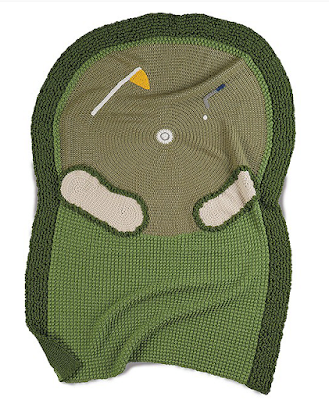 I've heard it so many times in the past few years - there aren't enough crochet patterns for men! While While this book isn't only for men, it will solve the problem of wanting something special to make for him - especially if you have a sports fan in your life! Difficulty Ratings: All patterns are listed as easy. 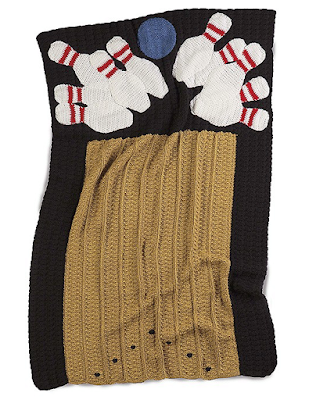 First Impression: These projects will make great gifts for men that love sports! My Favorite Project Pick: I always pick a favorite project when I do book reviews, but that was really hard this time. Mine & hubby's favorite sport isn't in the book, so I'm going to have to say the Poker Table is probably my favorite because of all the details included on it. The details on the chips and cards on the poker table is amazing! 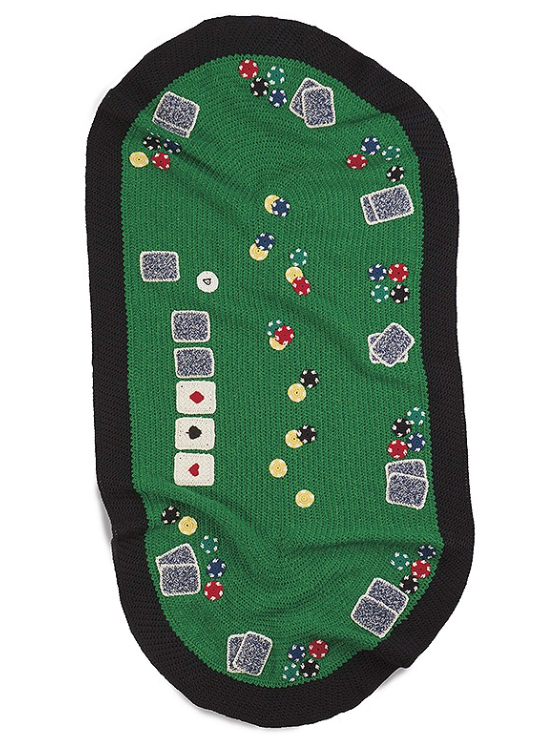 But Karen put a lot of thought and attention into the detail of all of them, not just the poker table. All the blankets are listed as easy. You will need to know basic stitches, with basic increasing and decreasing knowledge. The decrease stitching is in the stitch guide section of each pattern to make it easier. The booklet also includes all your general pattern info (gauge, terms, abbreviations), as well as exactly which yarns were used for each project. There are a few photo tutorials in the back for anything that is not a "normal" to a crochet pattern. There are 5 patterns in the book, but there is so much attention to detail that you won't be dissapointed. 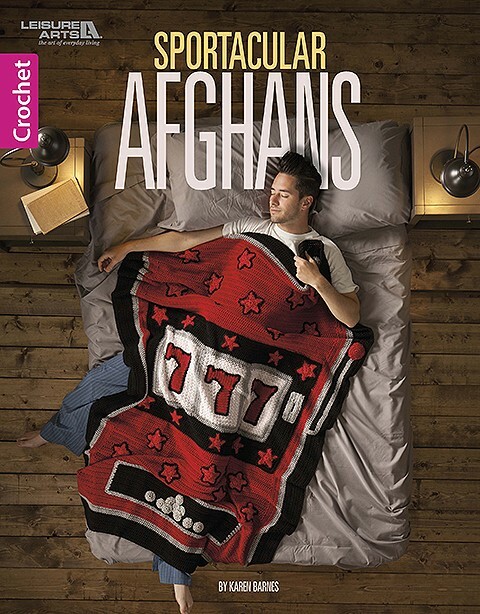 Each project has an afghan base with crocheted pieces that are sewn onto the top. This is perfect for working on the afghan at home and taking the smaller pieces to the projects with you.